Apply online application to CISF Recruitment 2018 447 Constable Driver. Combined Industrial Security Force (CISF) Recruitment Board, latest notification for Constable Driver. Applicants can get full advertisement below and submit the CISF online application at cisfrectt.in. Applicants who are going to apply, ensure CISF jobs that you are eligible for post of Constable Driver. The applicants will have to apply online, no other option. The last date of submitting online application is 19.02.2018. CISF notification further information such as eligibility criteria, syllabus and how to apply etc. listed below. Class 10 (High School) Exam Passed in Any Recognized Board in India. The upper age limit is also relax able to Government Servants including serving CISF personnel up to 40 years in the case of General and OBC candidates and 45 years in the case of Scheduled Caste and Scheduled Tribe candidates, provided they have rendered minimum 03 years continuous service, completed their probation period satisfactorily, maintained a punishment free record and have minimum annual grading of above "Average" during the entire service. Payment of application fee can made through Online Fee Mode Debit Card, Credit Card and Net Banking or Pay the Fee through E Challan Mode. 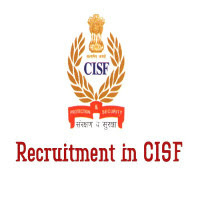 How to apply: Eligible applicant require to apply online through CISF Recruitment 2018 website cisfrectt.in from 19.02.2018. 1. Log on to the Combined Industrial Security Force (CISF) website cisfrectt.in. 6. Make the payment by Online Fee Mode Debit Card, Credit Card and Net Banking or Pay the Fee through E Challan Mode. Applicants have great chance to get jobs Combined Industrial Security Force (CISF) Recruitment, however if someone want to ask anything please comment below.